Inspired by The Hobbit and begun in 1937, The Lord of the Rings is a trilogy that Tolkien created to provide “the necessary background of history for Elvish tongues.” From these academic aspirations was born one of the most popular and imaginative works in English literature. The Fellowship of the Ring, the first volume in the trilogy, tells of the fateful power of the One Ring. It begins a magnificent tale of adventure that will plunge the members of the Fellowship of the Ring into a perilous quest and set the stage for the ultimate clash between powers of good and evil. 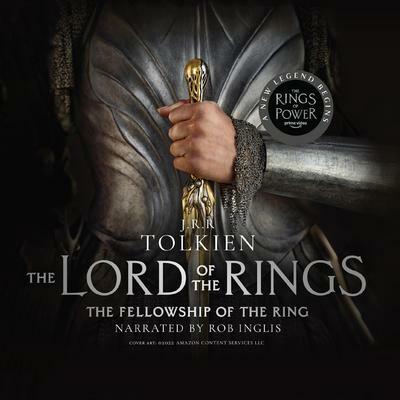 In this splendid, unabridged audio production of Tolkien’s great work, all the inhabitants of a magical universe—hobbits, elves, wizards, dwarves—step colorfully forth from the pages. Rob Inglis’ narration has been praised as a masterpiece of audio. Inspired by The Hobbit and begun in 1937, The Lord of the Rings is a trilogy that Tolkien created to provide “the necessary background of history for Elvish tongues.” From these academic aspirations was born one of the most popular and imaginative works in English literature. The Fellowship of the Ring, the first volume in the trilogy, tells of the fateful power of the One Ring. It begins a magnificent tale of adventure that will plunge the members of the Fellowship of the Ring into a perilous quest and set the stage for the ultimate clash between powers of good and evil. In this splendid, unabridged audio production of Tolkien’s great work, all the inhabitants of a magical universe—hobbits, elves, wizards, dwarves—step colorfully forth from the pages. Rob Inglis’ narration has been praised as a masterpiece of audio. Not bad, but...what's with Bombadil?! First of all, can I just say: What the heck is up with Tom Bombadil? I had the impression that he's a much-beloved character (at least in some circles)---but good grief, he makes even the elves seem hardly sappy at all by comparison! That whole section of the book was completely ridiculous---no wonder they left it out of the movie versions. One aspect of the book that the movie didn't fully capture, though, was Tolkein's portrayal of power-lust, especially through the characters of Saruman and Boromir. The ring represents a somewhat different temptation for the halflings (particularly Smeagol and Bilbo), a sort of unhealthy obsession with material objects, similar to that represented by Voldemort's horcruxes in Harry Potter (which also symbolize power-lust and a neurotic fear of death). The discussions between Gandalf and Saruman, and Frodo and Boromir, which were much better in the book and the movies should have used more of that dialogue or at least stayed truer to its spirit. They really helped bring out some of the basic themes of the novels more explicitly, but in the movie they were really watered down and generic by comparison, which really weakened the impact not only of those particular scenes, but of the movies overall. I've also heard it complained that the movies tried to force non-existent and vaguely hinted at romances to the fore, but I actually thought strengthening some of the romantic storylines was one of the better changes made by the adapters. It helped emphasize the values at stake, and in some cases actually tightened the plot and cut out unnecessary characters. For example, it was much better to have Arwen meet Aragorn and the hobbits on their way to Rivendell instead of some other random elf who played no further role in the story, rather than just having her be present at the feast given for Frodo after his recovery and then occasionally dropping subtle hints that Aragorn is in love with her. Tolkein basically just told us that there was a romance between them---the movie dramatizes it. Sam's interest in Rosie the barmaid also gives him a stronger reason to want to return to the Shire other than just that he longs for a peaceful, quiet life of gardening, and thereby raises the stakes for his character. I know the peaceful quiet life of gardening was really the whole point for Tolkein, but let's face it, he was a bit fruity on the subject (as witness the whole Tom Bombadil fiasco). As to this audio edition, Rob Inglis's narration is quite good---I enjoyed listening to his characterizations and performances of the songs and so forth.